leaky fuel line from fuel filter to engine? I notice the fitting of the fuel line that goes to the engine is slightly wet. please see picture. Do I have to change the line? Or a matter of changing some o-rings if there is any. There are no o-rings. It may be leaking from the crimp fitting; the line can degrade over time. Assuming it is wet with gasoline, and the fitting is tight then you absolutely have to change it. Do not drive the car until you do. FWIW, when I removed my manifold I found a line across the rear of the engine that had 'blisters' where the rubber had degraded. It was an engine fire just waiting to happen. +1 - No o-rings. Check to see if its wet with gas or oil before getting worried. If its gas, I would change it ASAP. I too had a "swollen" gas line and have changed all just to be safe. As for tricks for removing the air cleaner cover? After unclipping the 4 clips, I find there is not enough space to maneuver the cover out, unless I remove the oil fill cap. Then the cover will come out. I then replace the oil fill cover to make sure dirt doesn't fall in. +1 on the oil cap...I was going to answer it for you but seems you found the solution RR. I don't recall any o rings either on mine so I would check into the cost of another hose. thanks for the tips guys. While I am at it. I'd like to check other hoses for leakage. Could tell me other areas i should pay attention to? How many of those gas lines we have? I am studying the part diagram as we speak as well. Looked on pelican, they dont seem to carry that line under fule and intake section. The hoses are on PET 107-05. There are 5 main hoses that are pressurized with high pressure (30 PSI) fuel. Wow, Rob- nice job. I noticed you forgot to include a price total, so I'll put it in here for you: $alot. These may be one of the areas where new lines can be fabbed from the old metal parts; there's a guy on the P-Parts site who does the hydraulics, perhaps he'll do gas lines as well. I just spoke with Sunset about the five hoses Rob mentioned and the total is $422.04. They said it was cheaper if you order online but I couldn't find these hoses on their website. Mine had bulges as well. Just type/paste the part number in the search window to buy online. When I took a look at my lines they seemed like someone already did them so I'm going to leave it alone for now. 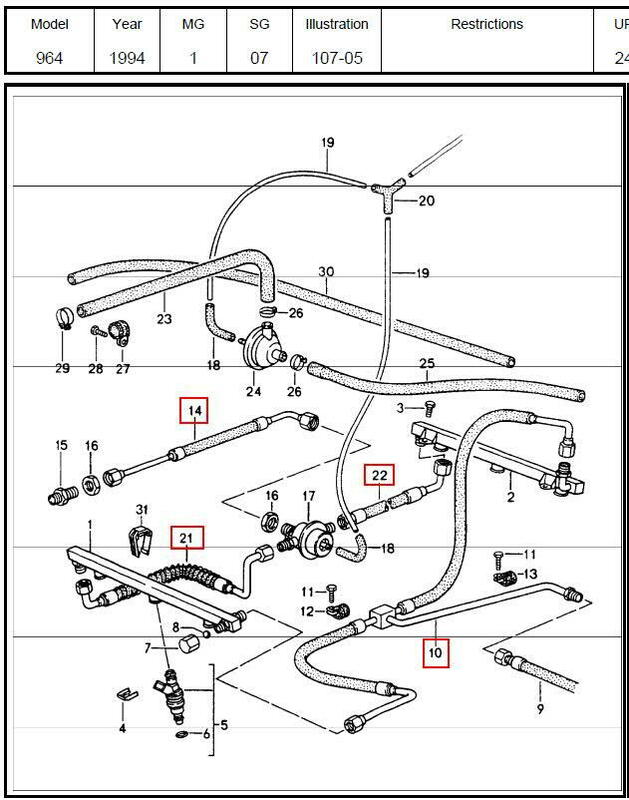 But if I were in your shoes I would not do the oem lines which seem sensitive to ethanol, but just have some other fuel lines made to size with fittings. That way the rubber won't crap out from ethanol anymore. As a piece of mind placebo I use the Stabil ethanol treament at the moment. The OE lines are NOT sensitive to ethanol. They are not rubber but Cohline semi rigid nylon tubing with a rubber sheath. They can leak at the fittings and must be replaced but it is a mechanical failure not an ethanol failure. The lines also suffer "bulges" in the rubber sheath but again the line is probably not ready to fail. As a test, puncture the bulge and see if its wet. I know the visuals will scare you, I bought and replaced all 5 lines when I saw the "bulge". Later, I took the offending line apart and found no leak only separated rubber shield! I guess this is the bulging that you're talking about. Can I got a hose specialist to replace the lines, using the original fixings? 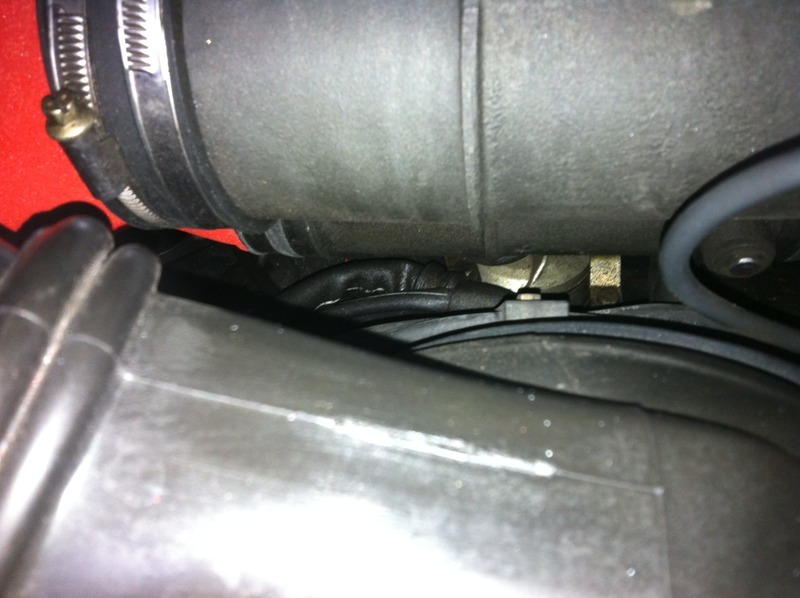 Quick Reply: leaky fuel line from fuel filter to engine?